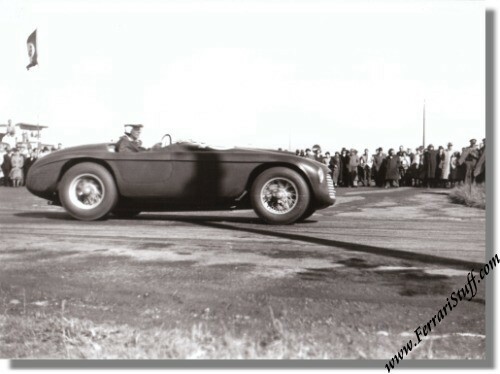 1949 Photo of on Ferrari 166MM S/N 0016M at the GP Luxembourg. This is a fantastic shot of Luigi Villoresi on May 26 en route to victory in the 1949 Grand Prix de Luxembourg in the factory entered Ferrari 166 MM, S/N 0016M. It was only the car's second race and it seems to be residing in Argentina nowadays. It measures some 9.5 x 6 inches (24 x 17.5 cm), is glossy black & white and appears to be a more recent print.